Early season’s greetings from your favorite (annoying) snowman who likes warm hugs! Frozen stars Josh Gad and Idina Menzel have shared some musical clips from the upcoming animated short, Olaf’s Frozen Adventure. The 21-minute short will air before Pixar’s latest film, Coco, and it mostly stars Olaf as he tries to find Elsa and Anna some holiday traditions, since they were too busy being sad, depressed, and glove-wearing to establish any of their own. It’s a cute premise that showcases different religious and secular festivities, but I’ve got to say, the way Olaf is asking families to share their traditions is a little, umm, questionable? That seems like kind of a private question, Olaf. 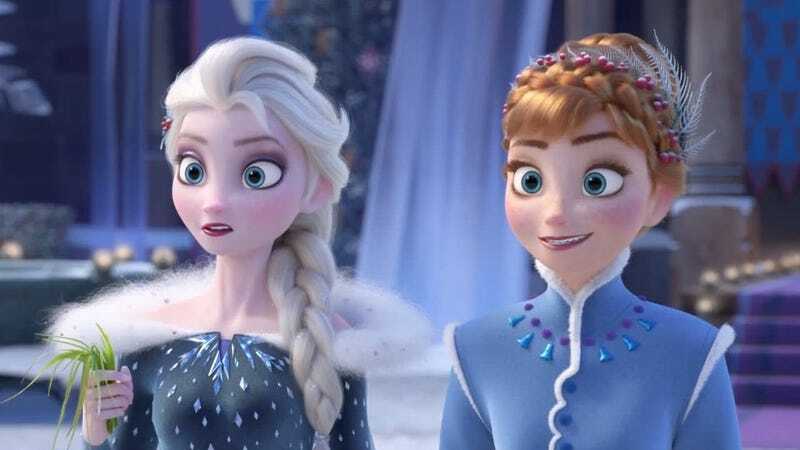 Menzel also shared a clip from Elsa and Anna’s big duet, “When We’re Together,” which was already featured on the debut trailer for the upcoming short. The soundtrack comes out November 3, and the short will be shown with Coco starting November 22.